"I didn't get to use the self-destruct mechanism, just as usual..."
Gundam Heavyarms, the machine that gives its pilot, Trowa Barton, an identity, and a name. Named after its appearance, Heavyarms does boast very heavy arms (^^; does that make sense?) hiding, or showing, the most amazing array of artillery and ammunition that anyone could imagine. Consisting mainly of the Beam Gatling on the left arm and the double Gatling guns in the chest compartment, Heavyarms also hides many missiles, cannons and guns, undeniably the Gundam with the superior weapons ability. Despite its wonderous artillery, I also think that Heavyarms got gipped in the weapons department because when it runs out of ammunition (as most guns often do), it is left with only an army knife, and not a very long one at that, on the right arm. Being a land based Gundam, Heavyarms is designed more for long-range combat, only going in for close-combat when out of ammo and resorts to the army knife. 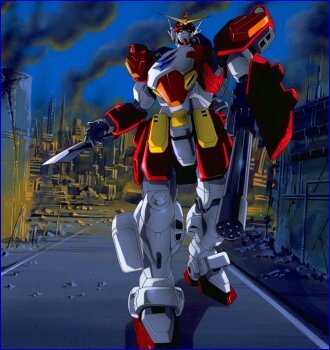 But however you want to look at it, this is one Gundam you would not want to standing in the way of! The pity about Gundam Heavyarms is that we don't get to see it for a fairly long period of time during the mid-point of the TV series. When Trowa infiltrated OZ and joined its ranks, Heavyarms was left behind. (He couldn't really take a Gundam with him now, could he? ^_^) Then when Trowa, in the MS Vayeate, saved Heero who, in the MS Mercurius, was about to be blown to pieces by a mad Quatre under the influence of Wing Zero's ZERO system, he lost his memory and so Heavyarms was once again forgotten. Later, Sally Po found Heavyarms and flew both it and herself to the Space Fortress Peacemillion where Heavyarms went under modifications and received a twin Beam Gatling and then was returned to Trowa.